Well, it's true. I was only eight or so when Falcon Crest started, a CBS nighttime soap set in fictional wine country, Tuscany Valley. I loved that show - had the biggest crushes on Lorenzo Lamas, Billy Moses, and even old Robert Foxworth. I loved watching Chase and Richard go up against the devious Angela Channing, played by the ex-Mrs. Ronald Reagan, Jane Wyman. Seriously, watching this stuff during my formative years is totally why I ended up a romance editor. Anyway, so like the Ewings fought over land and oil, the Channings fought over vineyards, grapes, and wine. 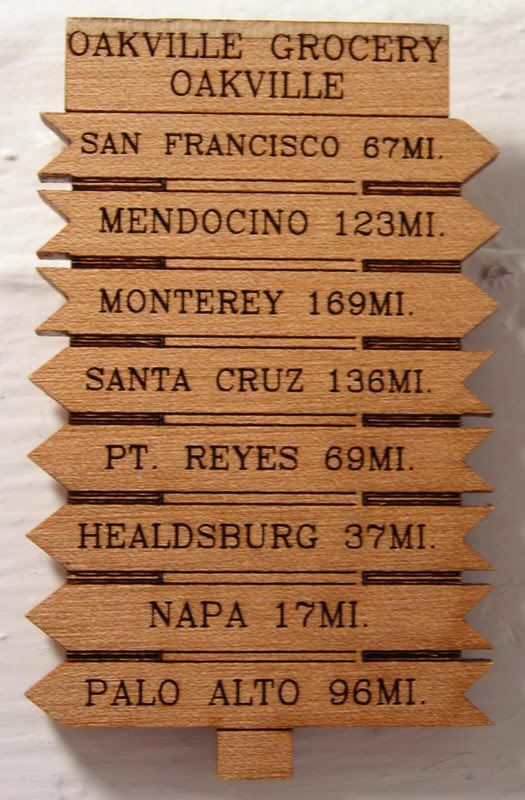 Anyway, a friend of mine brought this magnet back from her Napa trip - I don't know how she knew that I love these "this far from nowhere" signs, but there you have it. It's from Oakville Grocery, which looks like the cutest place ever. The kind of first-name basis place where the same people have been going since it opened in the late 1800s. I dunno why I didn't just drive the extra 169 miles from Monterey on my Woman of her Own Roadtrip, but at some point, a lost weekend in Napa is in order. And then we'll see if my tune about wine changes...or if I end up buying a case of wine - with the prettiest labels. I'm Henery the Eighth I am! Would you like a side with that potbelly (stove)? joy = fuddy-duddy. Yeah, I'll own it. Whew! Or, is that Who!